I draw them in SD size. The colossal type looks much more adorable. I'm not sure about color, I can't find good enough references. I was about to say "I think you're missing someone." But I can see you already have that taken care of. soooooooo adorable！ especially the third one! Not to mention he's about 10 times taller than the adjacent titans. I love this anime! Great work~! This is hilarious!! I never thought you could make titans look adorable. Aha! I will takw revenge and nom theae adorable Titans! Let's see how they feel being eaten. Anyway, adorable chibis! You managed to make something damn scary and freaky to something so adorable and lovable! 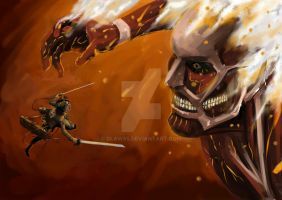 ish that titan eren on the side?????????? cute and creepy at the same time.